You are here: Home / Cookware Materials / Glass and Clay / What Happened to Corningware and Pyrex Glass Cookware? Corning, Corningware and Pyrex glass cookware bring great memories to a lot of home cooks. 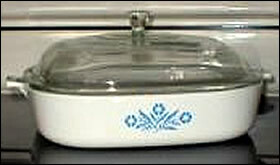 Just seeing the white ceramic casserole dish with the blue cornflower logo brings back memories of mom’s cooking. Picture her as she would whip up some potatoes, create a casserole, fry some chicken, or string green beans. Try to remember what she would use to cook with, and bring out to the table. Chances are, you will see some of that white cookware with a blue cornflower emblem on the side. That was corning glass cookware. She would bake with it, and since it was presentation quality, she would bring it out to the table for the feast. What happened to that corning glass cookware? The history of Corning goes back 150 years. Corning Glass Works developed the glass for Thomas Edison’s light bulb. It was in July of 1913 when, at the encouragement of a new scientists wife, Bessie Littleton, that Pyrex was born. Over the years they developed lines of glass and ceramic cookware and bakeware that was durable, attractive, easy to clean, and versatile. Though only a portion of their business, it was these consumer products that brought the name of Corning to the publics attention. More than 750 million pieces of CorningWare have been manufactured. In 1998 however, due to slumping sales and retooling of manufacturing plants, Corning sold off the CorningWare and Pyrex lines to World Kitchen, LLC. Under new direction, the CorningWare and Pyrex lines are still pretty strong, although different. Under the direction of World Kitchens, LLC, CorningWare transitioned from ceramic based products to stoneware. It is described as an evolutionary change to bring more color and versatility to the kitchen. The stoneware based cookware and bakeware is easy to clean, stores food easily in the refrigerator or freezer, non reactive to acidic foods, and can be used to prep, cook, and display meals. The stoneware based CorningWare is not to be used on the stovetop, whereas the older ceramic based products are. The older product lines have been discontinued from production, but are still available from a variety of sources. While the condition of “new” is becoming harder to find, “gently used” items are increasingly becoming popular. The old familiar Corning white ceramic bakeware with the blue cornflower emblem on the side and glass lid, while not rare, is actually starting to show signs of increased value. Items can be found on the internet under the names Corning, CorningWare, or Corelle. New or old, Corning and Pyrex products are considered healthy since they are non reactive to acidic foods, do not leave trace metals in foods, and are non porous. They are all easy to clean either by hand or in the dishwasher. If you are looking for stovetop-ready ceramic based cookware, there are choices, but they are harder to find. Emile Henry is a very fashionable and attractive line of French ceramic cookware and bakeware, and has recently introduced their “Flame Top” stovetop line of ceramics. Corning Visions, Where Art Thou? The Corning Visions cookware line has been discontinued for quite some time. While it was heavily rumored that the products fracture or explode under high heat, numerous tests under intense scrutiny could not duplicate any such results. The amber and cranberry colored ceramic-glass cookware is available online from a variety of stores. I found that one of the best places to get Corning Visions cookware is on e-bay. Corning glass cookware is alive and well in kitchens across the globe. Pyrex bakeware is more colorful, useful, and more transportable than ever. Whether glass, ceramic, porcelain, enameled, or some other material, it plays a vital role in every kitchen.